Honestly, I’m not the hugest halloween fan BUT any excuse to tuck into dessert has my vote! Also, death by chocolate? Sounds like a pretty good way to go! 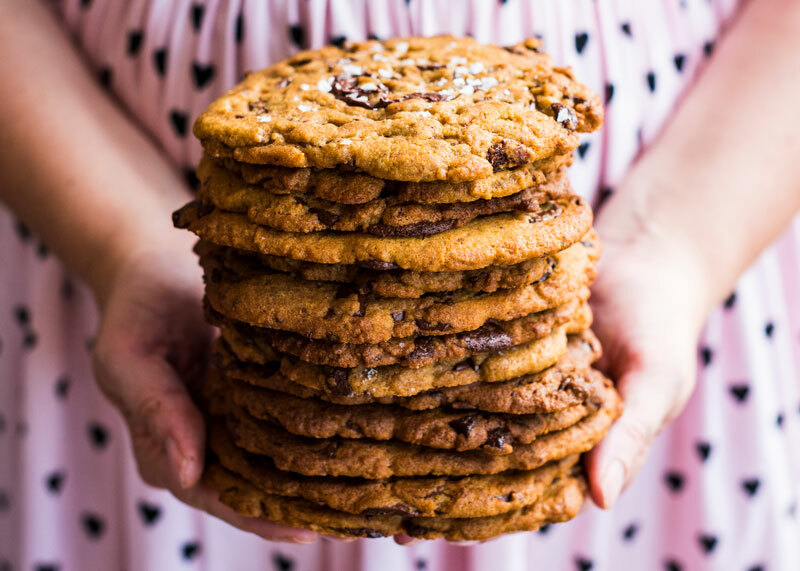 These are a few of my favourite treats – they’re easy to make and more importantly – look just the right amount of creepy without being gross. Afterall, we still actually WANT to eat them. These bleeding black bean brownies are deliciously deceptive in two ways – when you stab them with your fork a tangy bright red pool of raspberry puree bleeds all over your plate. 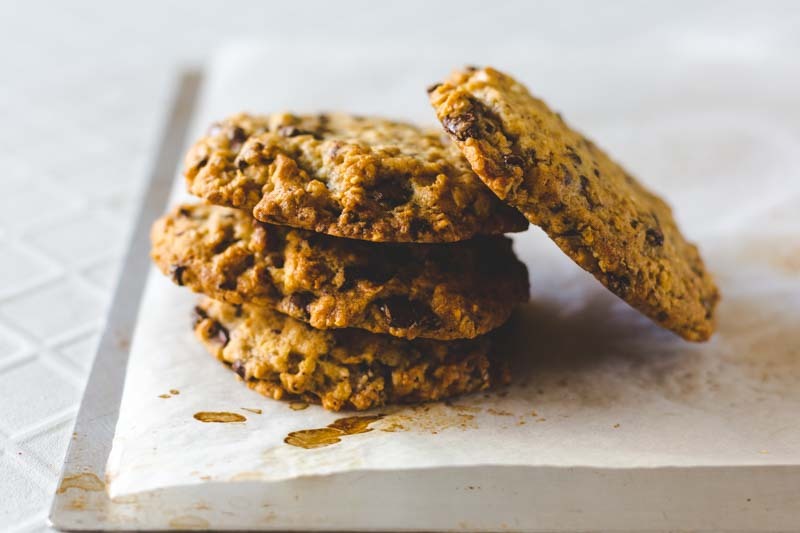 AND of course, they have vegetables hidden in them; the black beans make them perfectly fudgy and moist – and I promise they don’t taste like beans! Preheat the oven to 180 ̊C and grease a silicone heart-shaped muffin tray. Make the raspberry filling by placing the raspberries, 15ml (1 tbsp) sugar and lemon juice in a small saucepan over medium heat and simmer until reduced by half. Allow to cool completely. Make the brownies by melting the chopped chocolate, butter and vanilla extract together in a heatproof bowl set over a saucepan of barely simmering water, making sure the surface of the water does not touch the bowl. Remove from heat, stir in the 150g castor sugar, then leave to cool for a few minutes. Beat in the eggs and beans, then sift in the our, cocoa and salt and fold until the mixture is smooth and glossy. 5 Pour the mixture into the prepared tin, filling the muffin wells halfway. Make a dent in the middle, ll with the raspberry purée then top with more mixture and level the top. Bake in the oven until the top starts to crack but the centre remains gooey, 15 – 20 minutes. Remove from oven and allow to cool slightly before unmoulding the brownies and serving dusted with cocoa powder. 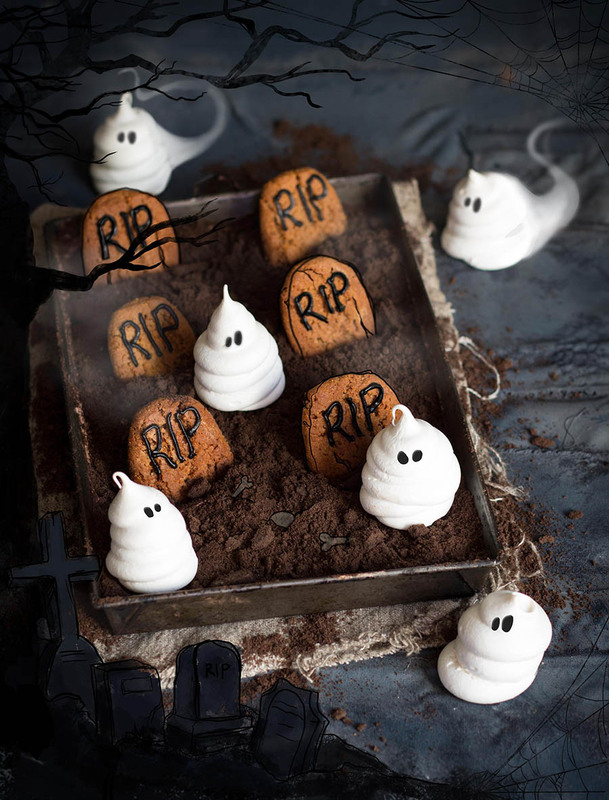 Ghostly meringues are probably my favourite trick or treat – they’re easy to make and when you take them out the oven you’ll find yourself giggling ‘cos they all look EXACTLY like Fatso from Casper The Friendly Ghost. Add some eyes using a toothpick and black gel or black sprinkles and voila! 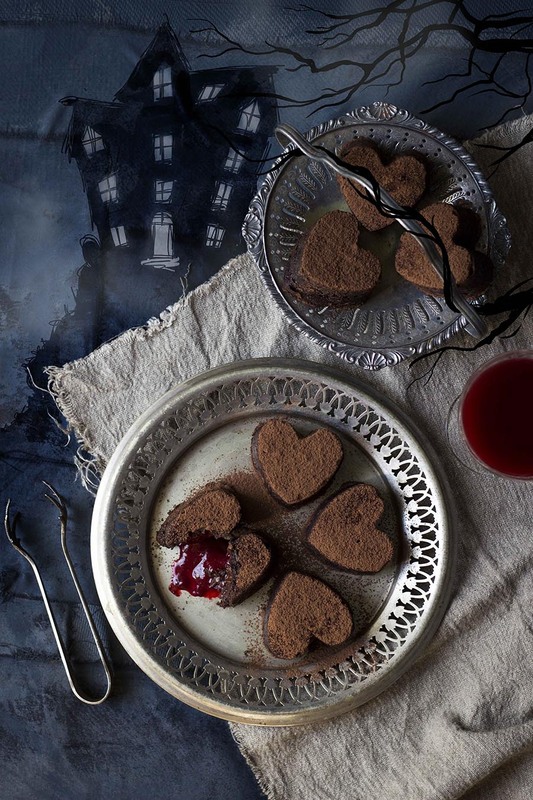 Pop the ghosts onto a creepy graveyard of death by chocolate mousse, some edible tombstones and dirt and you have a heart-stopping show-stopping dessert! Preheat the oven to 120 ̊C and line a large baking sheet. For the meringues, place the 2 egg whites in the bowl of an electric mixer and whip to stiff peaks. Gradually start adding the castor sugar, little by little, continuing to whip, until the meringue is very thick and glossy. Whisk in the vanilla then place the mixture in a piping bag. Snip off the end and pipe ghostly blobs onto the baking sheet. Place in the oven to dry (wedge a wooden spoon between the oven and the oven door to keep it ajar) and the meringues are crisp but still soft in the middle, 1 – 2 hours. For the chocolate mousse, place the water, coffee and 460g dark chocolate in a saucepan and heat gently over medium-low heat, while stirring, until melted. Once smooth, pour the coffee chocolate into a glass or metal bowl, which ts over another bowl. Fill the bottom bowl with the ice cubes and place the other on top. Using an electric hand mixer, beat the mixture until it starts to thicken and forms soft peaks. Gently fold the whipped cream into the chocolate mixture and pour the mousse into a serving dish or individual bowls and refrigerate until set. Preheat the oven to 180 ̊C. Line a baking tray with baking paper. For the tombstones, cream together the peanut butter and brown sugar until light and fluffy. Add the egg and bicarbonate of soda and mix for another 2 minutes. Roll teaspoonfuls of mixture into 7cm logs then flatten and place on the lined baking sheet, allowing enough space for spreading. Bake in the oven until lightly browned, about 10 minutes. Remove from oven and allow to cool. Pipe ‘RIP’ onto each biscuit using the melted 50g dark chocolate. To assemble the dish, sprinkle the biscuit crumbs on top of the mousse for the soil, then insert the tombstones and position the meringue ghosts. 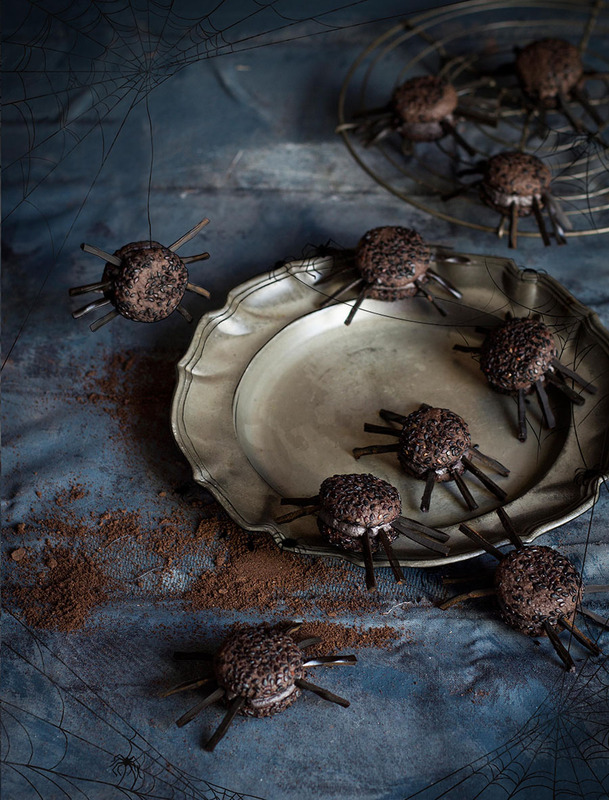 These whoopie pie spiders are perfect for spreading on your table – they double as creepy decor – and guests can eat them! 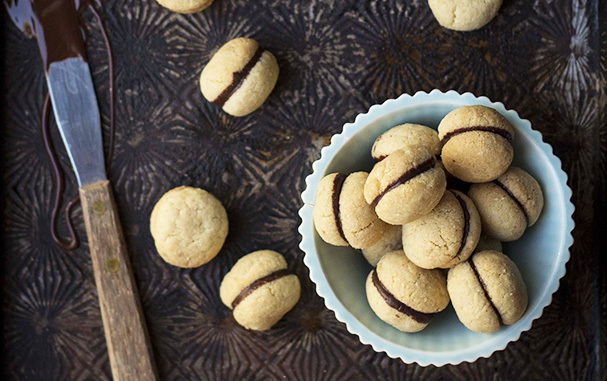 If you can’t find tahini, swop it out for peanut butter or any other nut butter. Preheat the oven to 150°C and grease and line two large baking sheets. Cream the 125g butter and sugars together until pale and creamy. Add the eggs, one at a time, and beat until combined. Add the black gel food colouring to your preference and mix to combine. Add the our, cocoa and baking powder and mix until combined. Spoon teaspoonfuls of the mixture onto the baking sheets, then sprinkle with black sesame seeds. Flatten slightly and bake in the oven, 15 – 20 minutes. Remove from oven and place on wire racks to cool. For the lling, place the 60g butter, tahini, milk and icing sugar in a mixer and whip until light and uffy. Add the black gel food colouring to your preference. 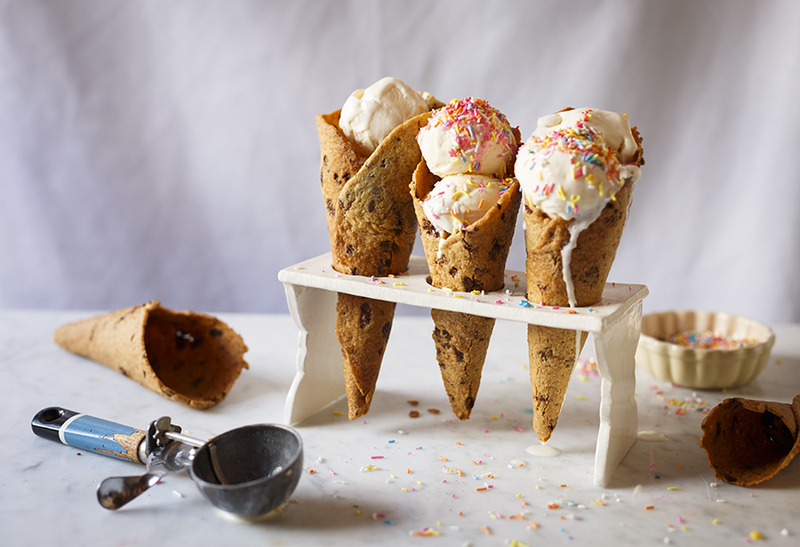 Place the frosting in a piping bag, snip off the tip and sandwich the whoopie pies together. Cut the liquorice into strips and insert the legs into each spider while the buttercream is still soft.